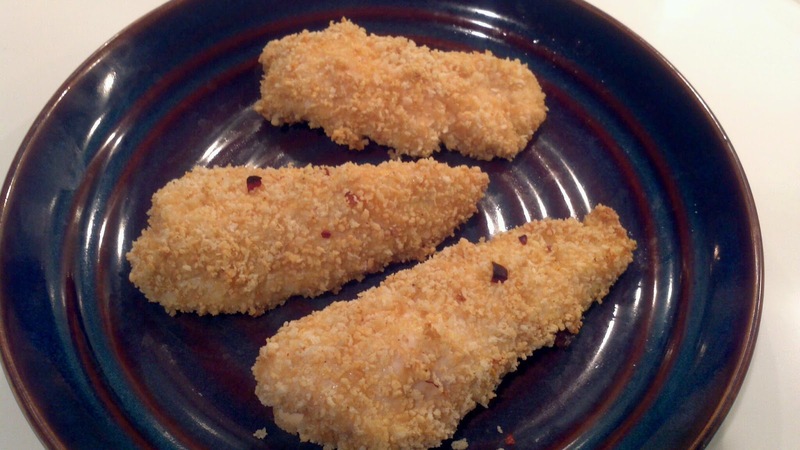 Baked chicken fingers are a healthy alternative to deep fried, and Japanese Panko breadcrumbs are ideal for achieving a crispy coating in the oven. This recipe can be adjusted to your taste for spice--the measurements provided are for mild heat. 1.2kg boneless, skinless chicken breasts, sliced into "fingers"
Preheat oven to 375 degrees F. Grease a large baking sheet with Canola spray. In a food processor, grind peanuts into very small pieces. Transfer peanuts to a mixing bowl and add breadcrumbs, ginger and spices. Mix until uniform. In a second bowl, scramble the egg. Coat each chicken finger in egg, allowing excess to drip off, then roll in breadcrumb mixture to fully coat. Place coated chicken fingers on baking sheet. Bake for 18 minutes, or until chicken is cooked through.